By the time we arrived in Mudgee we had spent a night in a low-cost ($5) camp at Wattle Flat and then a night in Hill End. It had been hot and we were in need of a decent shower, a recharge of some batteries and I had a bit of washing to catch up on. I rarely book accommodation in advance as we often change our mind about where we are going next. So as we were coming into town, I looked up Mudgee caravan parks and found the Mudgee Riverside Caravan and Tourist Park. A quick phone call confirmed they had plenty of room for us so we headed straight there. We were greeted by relieving Park Managers, John and Rosie, and a nicer, more friendly couple you’d be hard pressed to find. They gave us a choice of three sites and John showed Brenden where they were. We chose a spot right next to a shady tree and it wasn’t long before we were set up and had a beer/wine in our hands! The park covers quite a large area. There are loads of shady trees and given that Mudgee has not had much rain in recent times, there is a considerable amount of green grass. There are both powered and un-powered sites available. Some have a concrete slab, and some, like the one we chose do not. If you are not a caravanner or a camper, there are numerous cabins of varying sizes and styles available. Pets are also welcome, on application and we saw a number of people that had their dogs with them. There is also a small children’s playground at the front of the park. There are a handful of permanent residents in the park but this area is almost separate to the main park area. Great sites, shady trees and even some green grass! Mudgee Riverside Caravan Park has two amenity blocks. One is in the main section of the park and the other is in the area where the permanent residents are. Both were very clean and the main block was well maintained. There was good water pressure and plenty of hot water. The second block was in need of some general maintenance. The paint was peeling off the ceiling and the hand basins were old and a bit worn. However, as I said they were clean so I am always happy with that. There were four washing machines and a dryer and these were also clean as was the rest of the laundry. There were also generous sized clothes lines. I was also impressed with the size and facilities in the camp kitchen. Right down to a purpose built fire pit in the middle of the kitchen area. Just right for those chilly Mudgee nights. The park has a good sized, functional camp kitchen. 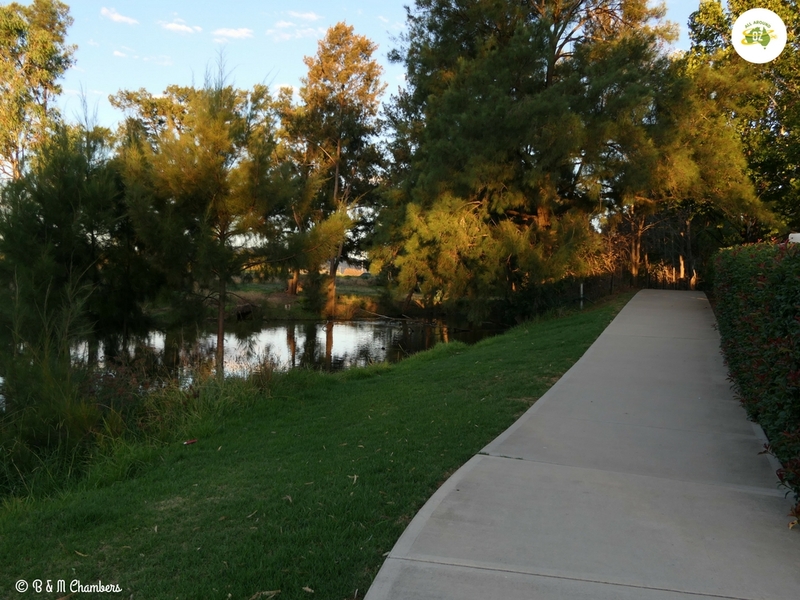 As the name suggests, this park is located right alongside the Cudgegong River. Walk out the back gate and there is a walking track that winds it’s way along the river. If you turn right this takes you back towards town and is a great spot for an early morning walk. There is even some exercise equipment along the way as well. Or you can easily walk up into the main street to grab a coffee or a bite to eat. Take a walk alongside the Cudgegong River. We really enjoyed our stay at Mudgee Riverside Caravan and Tourist Park. It does get busy come Friday afternoon, as Mudgee is a popular destination for a weekend get-away. To get in touch with Mudgee Riverside Tourist Park you can visit their website HERE.